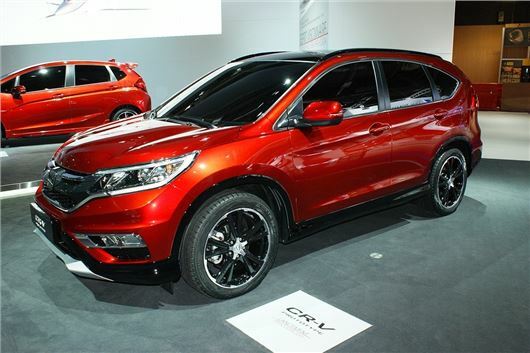 Honda has revealed its fresh CR-V at the 2014 Paris Motor Show. The Swindon-built model gets revised styling with new headlights, rear lights and bumpers, plus a new tailgate design. The updated model should be available before the end of 2014 and pricing is unlikely to change. A new variant of the 1.6-litre i-DTEC diesel engine has been added to the line-up. It produces 160PS and 350Nm of torque and replaces the old 2.2-litre diesel engine. Emissions are 130g/km with a manual transmission, or 135g/km with the new nine-speed automatic transmission. The 160PS diesel CR-V will be available with four wheel drive while the 120PS 1.6-litre i-DTEC diesel will continue to be offered with front-wheel drive and manual transmission only. It has lower emissions, down to 117g/km.